Before you start email, an email address is required. 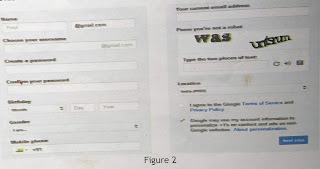 I n this I will show you how to create an email address with Gmail. 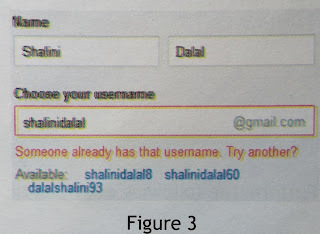 To create your Gmail account you only need a web browser and an internet connection. On the address bar type www.gmail.com . You should now get to a page that looks something like the one in Figure 1. Click on create account and then proceed to the next step. After you click on the signup link, you shall be shown a form with several fields which need inputs. This is shown in figure 2. Choose a login name or username: Choosing a login name is part art and part common sense. Since it determines with your email address will be, we suggest you spend a little time over it. E-mail address need to be unique which means that no two people in the world can have the same address. That is no guarantee that your preferred login name would be available. The following are advice and suggestions on how to choose a login or username. First check if you can get a login name of your name, first name, last name, or first name+last name. E,g. 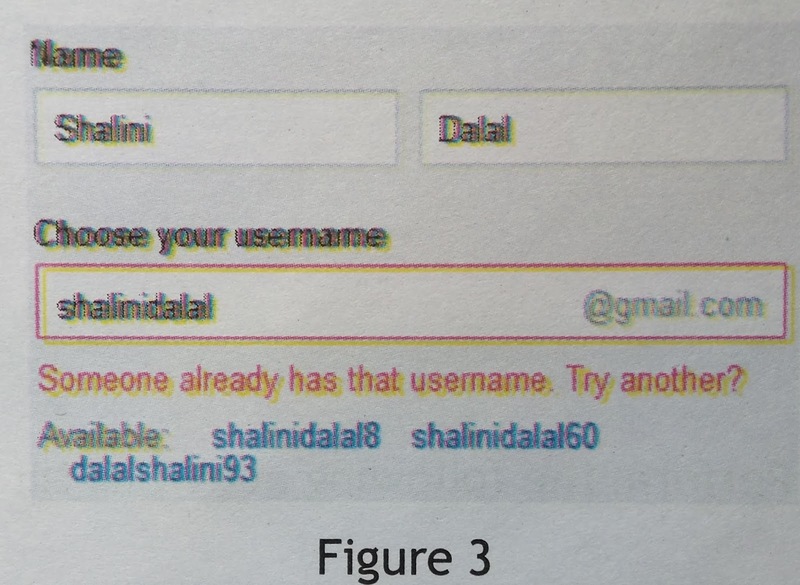 Shalini or dalal are Shalinidalal or the more popular, first.last name (e,g. shalini.dalal or dalal.shalini). Getting a gmail address of your name is indeed very fortunate because of the sheer number of subscribers to the servive. Your login name needs to be catchy and at the same time describe you so people are able to recall it without much difficulty and associate with you. You can also opt to choose your first name and your birth date: e,g. vicky14. When you move the cursor to the next input field password, in case the username is not available, a message is displayed. Shown in Figure. You can go back to username field and change it. Choosing a password for your email: Securing your Gmail email account with a strong password is important. Think of the password as the key combination to your safe and give it the same amount of importance. A combination of uppercase and lowercase letters with some digits would be a strong enough password. You need to enter the password twice. You can leave the “Remember me on this computer” box unchecked. Enter your birth day and gender. Current email address: in case you already have an existing email address, you can enter that here, or leave this blank. Prove you are not a robot: Enter the characters displayed in this picture, above the field. 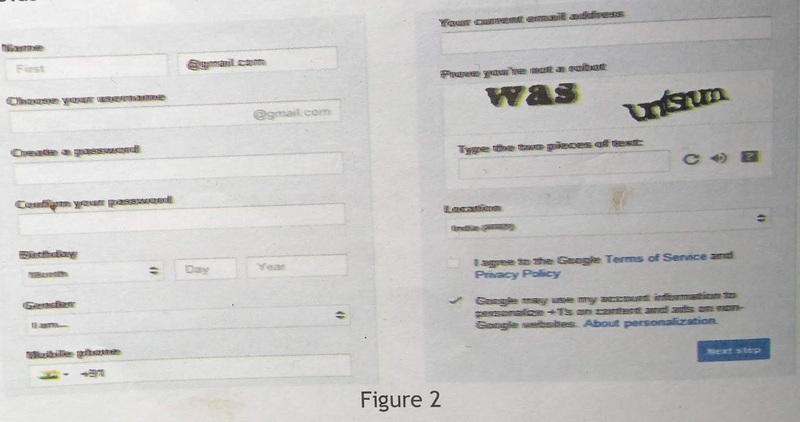 This is required so that Gmail knows that the inputs are from a human being and not some automated program. Now that everything is set, you can go through the Terms of service and click on the “I accept. Create my account.”button which will create your very own free gmail account ! Click next. You will be asked ti add a profile photo. You can for the time being skip this and select Next Step. Your gmail account is now ready and the inbox will open as shown in Figure. Note : The email address and password in a secure place.